I haven't had a contest in a long time, it's due. 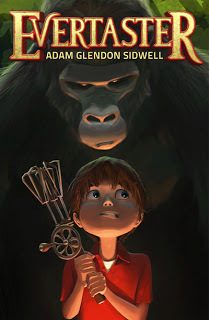 On today's Authors' Think Tank podcast we had Adam Sidwell join us on the show (YAY!!). Adam is a blast! He has written Evertaster and The Buttersmiths' Gold and hope we can have him visit the podcast again in the future. I have an extra *SIGNED* copy of his first book, Evertaster, and thought that a giveaway would be an excellent tie-in to the show. And enter below for your chance to win your own copy of Evertaster*. Contest ends this weekend, but you can tweet about it every day for extra entries. May the cupcakes be forever in your favor! *Apologies to my friends outside of The States, but I can only afford to make this available to people within the United States. Enter more legalese here for any exploits that hasn't occurred to me yet. (If you have a question, I'm easy to find so ask away).